The Gap Funding Initiative (GFI) is a $16.4 million grant program funded by the American Red Cross and the Hurricane Sandy New Jersey Relief Fund that offers grants to help eligible homeowners cover the costs of home repairs incurred as a result of Hurricane Sandy. Eligible homeowners must be approved for Reconstruction, Rehabilitation, Elevation, and Mitigation (RREM) funds by the New Jersey Department of Community Affairs' reNEW Jersey Stronger program and still have an 'unmet need' to cover the cost of home repairs. The GFI application period opened in October 2013 and closed in October 2014. During this time, over 1400 applications were received from homeowners impacted by the storm. Grant decisions were made on an individual basis, taking into account household income, financial need, program funding parameters, and funding availability. 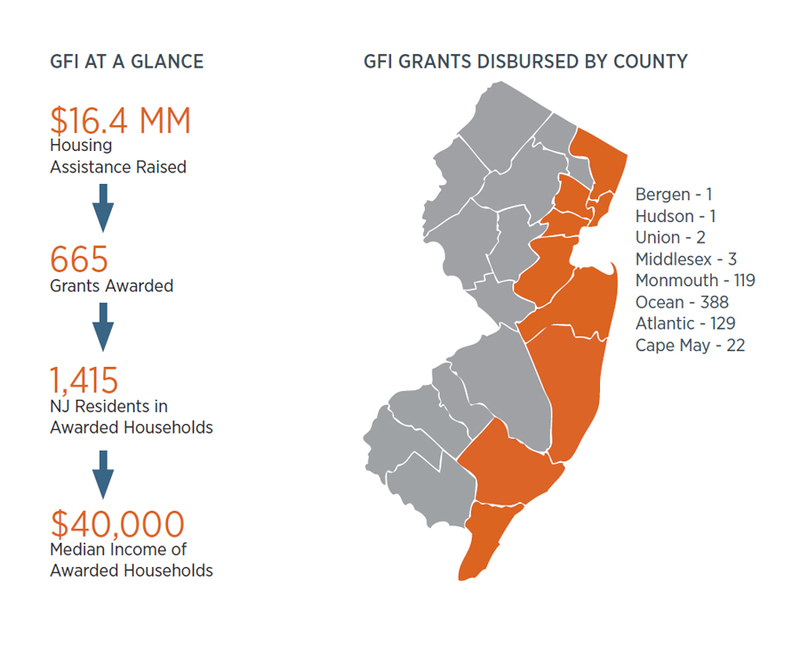 As of June 30, 2016, GFI disbursed grants to 665 awardees in eight Sandy-impacted counties. The American Red Cross shelters, feeds and provides emotional support to victims of disasters; supplies about 40 percent of the nation's blood; teaches skills that save lives; provides international humanitarian aid; and supports military members and their families. The Red Cross is a not-for-profit organization that depends on volunteers and the generosity of the American public to perform its mission. For more information, please visit www.RedCross.org or visit us on Twitter at @RedCross. The Hurricane Sandy New Jersey Relief Fund, chaired by First Lady Mary Pat Christie, raised and distributed funds to organizations active in the recovery and rebuilding efforts of communities impacted by the storm. Before closing in March 2016, the Relief Fund responsibly distributed $37.8 million to 109 nonprofit organizations assisting New Jerseyans with mental health support, social services, housing assistance and financial and legal counseling. For more information about the work of the Relief Fund visit http://sandynjrelieffund.org. New Jersey Community Capital (NJCC) is a nonprofit community development financial institution that provides innovative financing and technical assistance to support sustainable community development ventures. Since being founded in 1987, NJCC has invested over $560 million to support families and communities in need, resulting in the creation or preservation of over 8,800 housing units, 6,000 early care spaces, 13,000 education slots, and 6,900 jobs across New Jersey. For more information about our programs visit www.NewJerseyCommunityCapital.org.